in the dirt, that is! This cold, snowy, icy weather has left me dreaming of warm spring days. Days when I can slip outside and plunge my hands into fresh soil. Gardening has become my escape from the craziness that has become our lives. Now that my little ones are getting a little more independent I’m looking forward to getting them more involved in gardening. Enter Pinterest! I’ve found some lovely ideas and beautiful gardens. Take a look! 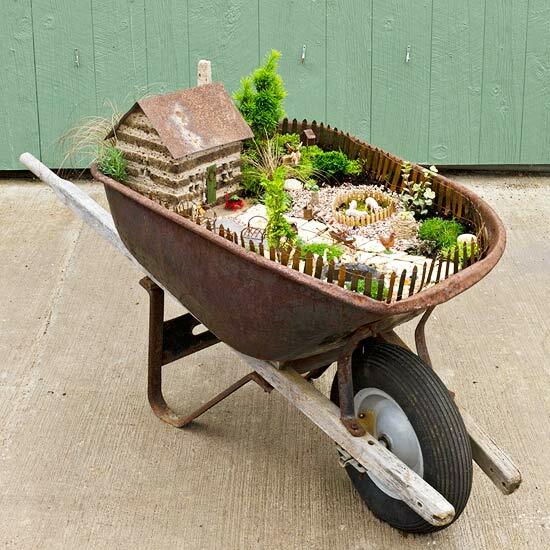 How clever is this wheelbarrow fairy garden? You can make it as complicated as you want or you can choose to use things you have around the house. Since I have little ones around we have a plethora of little toy figurines that I’m sure they would love to incorporate and make their wheelbarrow garden their own. Ann egg garden! What a cute way to start seedlings! The best part? When transplanting all you need to do is drop the whole thing in the ground, because of course the egg-shell just decomposes while adding nutrients to the soil. I love how the author of the link above tied the egg-theme gardening to Lent too! 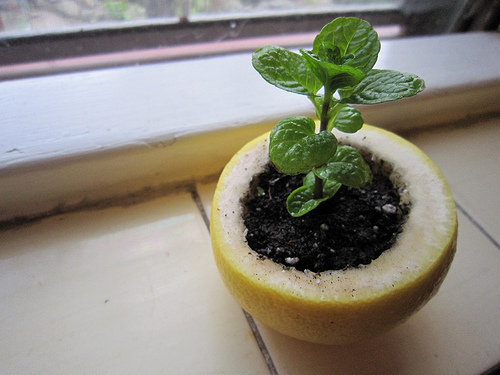 Yet another way to start your seedlings…in a citrus peel! Love herbs but not so big on traipsing out to the garden in the middle of dinner time to cut a bunch? Here ya go, a back door herb garden in galvanized buckets. Genius! I love the tiers! 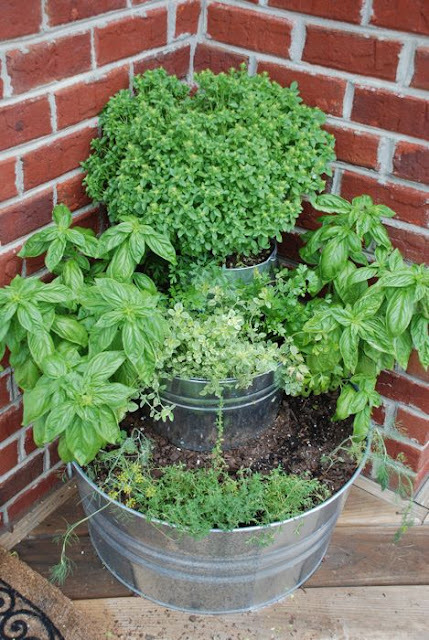 Thinking I’ll probably do a theme herb garden…Italian herbs for bruschetta, caprese salad, spaghetti sauce…YUM! Edible landscaping! Not only is it pleasing to the eye but it’s your own little produce section, right in your backyard! Plant lettuces, chard, carrots, kale…you name it! A beautiful array of succulents. I can’t wait to try succulents…I’m feeling optimistic since we live in succulent friendly zone. Oh spring, you can’t come too soon! Categories: Gardening, Pinterest, What I am loving | Tags: children, Garden, Home, Kitchen garden, Plant, Soil, Succulent plant, vegetables | Permalink. OMG this is amazing. First time I’m seeing such images or anything like them. The eggs lol, new pots! wow wow excellent concept! And the first picture is perfect! Thanks! The images in the post were grabbed off of other sites, if you click on them you will be led to the site. The feature image is mine, however. Took this one a couple years ago at a local park.